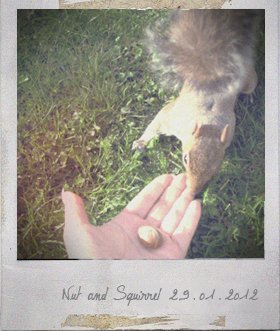 I and my neighborhood squirrels love nuts. munch munch. Add the penne to lightly salted boiling water, cook until al dente (follow the package directions). Drain and set aside. Peel and lightly crush the garlic cloves, place into a large frying-pan with 2 tablespoons of olive oil over medium heat. Fry the garlic until golden, then remove and discard. Add the gorgonzola and single cream into the frying-pan and stir over low heat until the gorgonzola is melted. Add the cooked penne and toss well with the sauce. Turn off the heat, add the chopped walnuts and wild rocket and toss gently. Transfer to serving plates, sprinkle with black pepper. 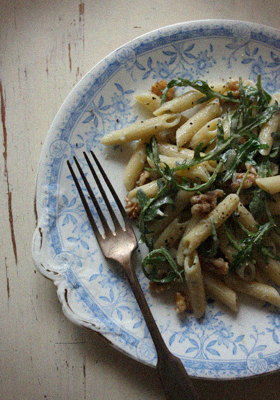 You are currently reading Penne with Gorgonzola & Walnuts at Fish Trip Cafe.